Born in conflict-torn Sudan, Lurit Bepo moved to the U.S. at age six. 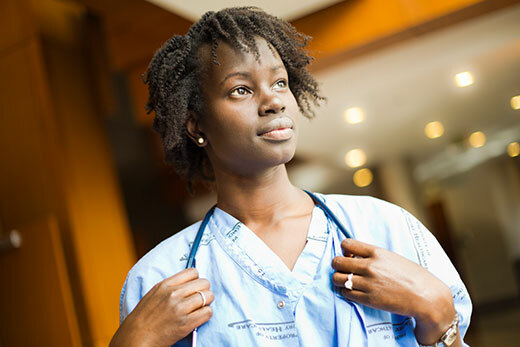 As an Emory medical student, she returned to the country to view the hardships faced by the state-run hospital, fueling her interest in health disparities and policy. Lurit Bepo was born in conflict-torn Sudan during the civil war that left more than 4 million people displaced and more than 2 million dead. Her family — her mother, two older brothers and two younger sisters — emigrated from Khartoum to the Dallas-Fort Worth area when she was six, joining her father who was pursuing his master's degree in electrical engineering. "All the recent changes around immigration are very poignant for me, as someone who came over as a political asylee from one of the countries now banned," Bepo says. She attended public school and completed her junior and senior years at the Texas Academy of Mathematics & Science, a boarding school based at the University of North Texas where she lived in a dorm with 200 other high school students. This experience, at a school known for its rigorous academics, where students get college credit for classes, the opportunity to work with faculty in their laboratories, and internships at such distinguished institutions as NASA, helped to shape her career interests. "A high percentage of our graduating class became MDs," Bepo says. But perhaps equally influential is the fact that many of her immediate relatives are in the medical field, from her mother, a nurse, to her cousins in South Sudan and an uncle in England. Bepo went on to study biology and anthropology at Washington University in St. Louis, and is graduating from Emory with an MD/MPH. "Interventions that we as physicians implement account for about 10 percent to 20 percent of a person's health," she says. "The rest are health behaviors, social and environmental determinants, genetics, etc. My approach to medicine as a field is not to look at individuals but at society as a whole." At Emory's School of Medicine, Bepo was the president of the Student National Medical Association, organized community service programs, was a member of the Executive Curriculum Committee, and was a student interviewer for the admissions committee. "I learned so much at Emory, such as the importance of good mentorship," she says. Her own mentors included Danielle Jones, associate professor of medicine, who "taught me to be confident in myself and my abilities," and Maura George, assistant professor of medicine, who "models the kind of physician I want to be — very involved in the community, and in teaching students and residents about health disparities." Bepo will spend her residency in internal medicine at the University of California, San Francisco — with her husband, Nicholas Prickel — which best meshed with her focus on community health, advocacy and policy. Health policy decisions are more than just partisan jousting, she argues: "Health policy is so relevant right now, and impacts such a large number of people. There's a tendency to think that not having medical insurance doesn't kill people, but it does." She chose internal medicine, she says, because "the way our health care system is changing, physicians being that repository of knowledge for their patients is really valuable. You're like the quarterback." And also, she says, a broad knowledge base is advantageous when dealing with developing health care systems in other countries. Between her first and second years of medical school, Bepo returned to shadow an old classmate of her dad's at the 580-bed state-run Juba Teaching Hospital in South Sudan. "They were delivering babies by flashlight in the middle of the night," she says. "There's no blood bank, no ultrasound, and you have to get diesel fuel to keep the generators working. When those are the conditions, it is less about medicine and more about general knowledge and common sense." Bepo's long-term career goals are to be involved in academic medicine, teaching, health disparity research, and health policy development and implementation. "That's where the power and the ability to make change lie," she says. "If you want change, you have to work for it and be persistent."